There are videos of past monthly programming that have been recorded and national webinars that are available through the chapter. This is a new benefit we are offering to members and hope that you find these videos useful. To access these trainings go to Resources and log in with your AFP member information. 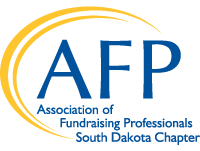 South Dakota AFP has partnered with the Sanford Institute of Philanthropy at Augustana University to offer a discounted rate for SD AFP members. Members will receive $100 off the registration for the full institute. To access the discount promo code go to Resources and log in with your AFP member information. The institute also offers professional development you can access at your desk. Go to augie.edu/institute to view the series of short training modules.